Former Massachusetts Gov. Deval Patrick is set to announce that he will not run for the Democratic presidential nomination in 2020, according to multiple reports. Patrick has informed his staff and advisers that he has decided not to run in what is expected to be a crowded Democratic primary, Politico reports. Patrick was a close ally of former President Barack Obama and it was reported that many former Obama staffers and the former president himself was encouraging the governor to run for the White House. Patrick is expected to hold of making an announcement until after Wednesday because of the funeral for former President George H.W. Bush, the New York Times reported. The person who confirmed Mr. Patrick’s decision, and spoke on condition of anonymity late Tuesday night to share confidential information, declined to say why Mr. Patrick would not run. Mr. Patrick’s decision was first reported by Politico. He was not expected to make any announcement Wednesday due to the national day of mourning for President George H.W. Bush. In a September interview with former Obama advisor David Axelrod, Patrick was worried about being able to stand out in a crowded primary. "It’s hard to see how you even get noticed in such a big, broad field without being shrill, sensational or a celebrity — and I’m none of those things and I’m never going to be any of those things," Patrick said. Rep. David Cicilline (D., R.I.) predicted that as many as 40 Democrats will run for their party's 2020 nomination. If Patrick decided to run, he would not only had to figure out how to navigate a crowded primary but also defend attacks on being a managing director for Bain Capital. The private investment firm is the same company Democrats attacked Patrick's predecessor, Republican Gov. Mitt Romney, for having worked. 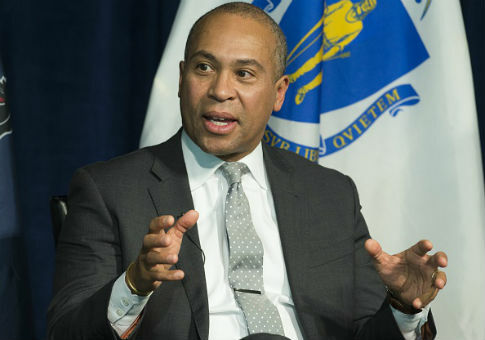 This entry was posted in Politics and tagged 2020 Election, Democratic Party, Deval Patrick. Bookmark the permalink.